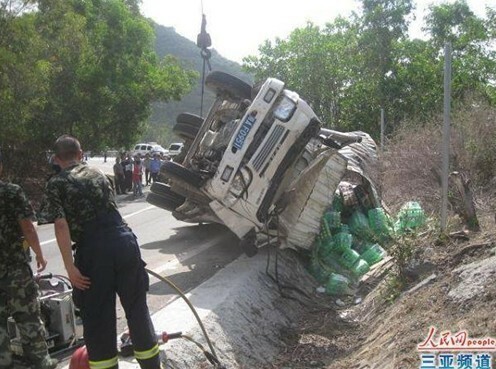 Around 11 am Tuesday morning, a driver was rescued after his truck overturned at the road junction of a highway near Tianya Town in Sanya. At 10:00 am, fire crews were called out shortly and attend to the scene of the accident 30 minutes later, where the driver got stuck in his truck with slight injuries. After getting the details about the accident, ambulance staffs gave the driver first aid and reported the trapped driver had to cut free by emergency services. According to the preliminary investigation, overloading may have contributed to the accident as the driver lost control of the vehicle and slipped off the road.